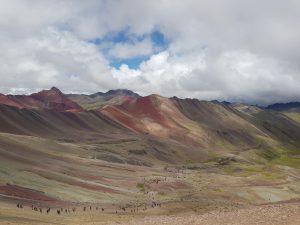 Home » Blog archive » Rainbow Mountain: an absolute must-see! Rainbow Mountain is one of the most famous and greatest highlights of Cuzco. You definitely need to see this special nature phenomenon! A lot of agencies in Cusco offer trips to Rainbow Mountain, also known as ‘Montaña de Siete Colores’. However, the Spanish school also offer this trip, so we booked the trip with the school by all means. If you book a trip through the school, you’re sure that everything is well arranged and you never pay too much. The trip costs 70 soled and is including transport, breakfast, lunch and a guide. Around 5 o’clock in the morning you are being picked-up at your accommodation and the trip can begin. After driving for about one and a half hour, it was time for a break to have breakfast. Of course there are Coca leaves available at the café. These magical leaves reduce the effects of height illness. 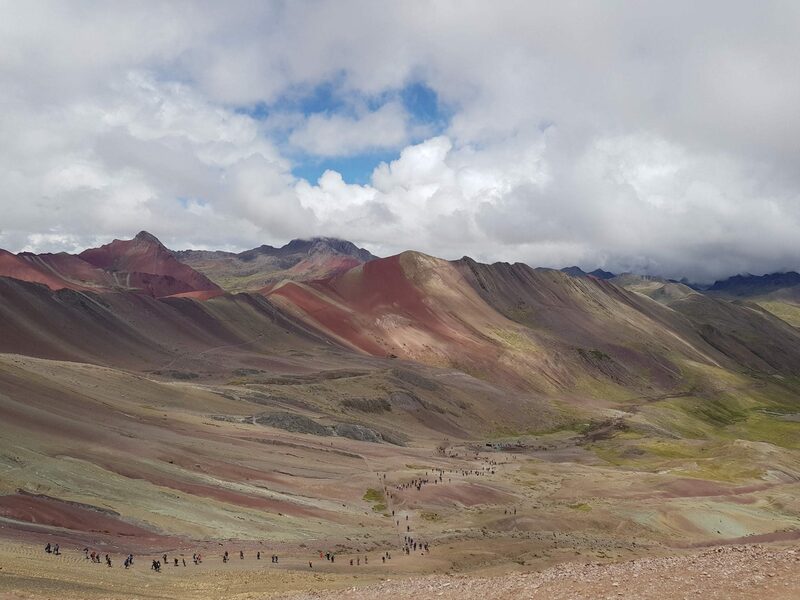 Since the Rainbow Mountain is at a height of 5,200 meters, you can definitely get bothered by the effects of height illness. The coca leaves can therefore come in handy! After breakfast the journey continues. The landscape slightly changes and we end up in a way more mountainous area, within a beautiful valley. Only the view up here is already fascinating! After driving for one more hour, we arrived at the place where we trade the bus into a hike. Even though there is a lot said about the hike being very difficult, is my personal opinion that it is not that bad. The first hour is a piece of cake. The path is mainly flat and besides that is the view outstanding: a mountainous landscape full of alpacas! At this point you would not expect at all that a colourfull mountan will loom up in a bit. The last part as the hike can be described as tough. It is steep, very steep. But with the Rainbow Mountain within sight and some perseverance you will reach the top with a satisfied feeling. The view is unbelieveable! However it is full of tourists, but that makes sense: everyone wants to see Rainbow Mountain with its own eyes! Even though I prepared myself for the fact that the view might be a bit disappointing, because of all the photoshoped ads in the city, I was absolutely not disappointed! The mountain is truly unique, with all its beautiful colors! You won’t find anything like this anywhere else on the world. 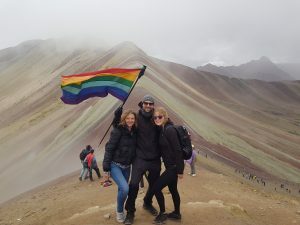 You must see Rainbow Mountain with your own eyes, it is awesome! 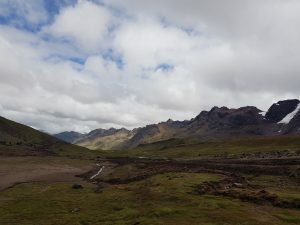 Don’t let the stories about the hike stop you from going: of course it differs per person how you experience the hike, but it is honestly not that tough! The same applies for the height illness. Personally I didn’t feel anything of the height, despite a worse fysical condition, same as in Cusco. If you just do the hike at your own speed, everything will be fine!